Tickets on sale at ParamountBristol.org for this fun family musical! 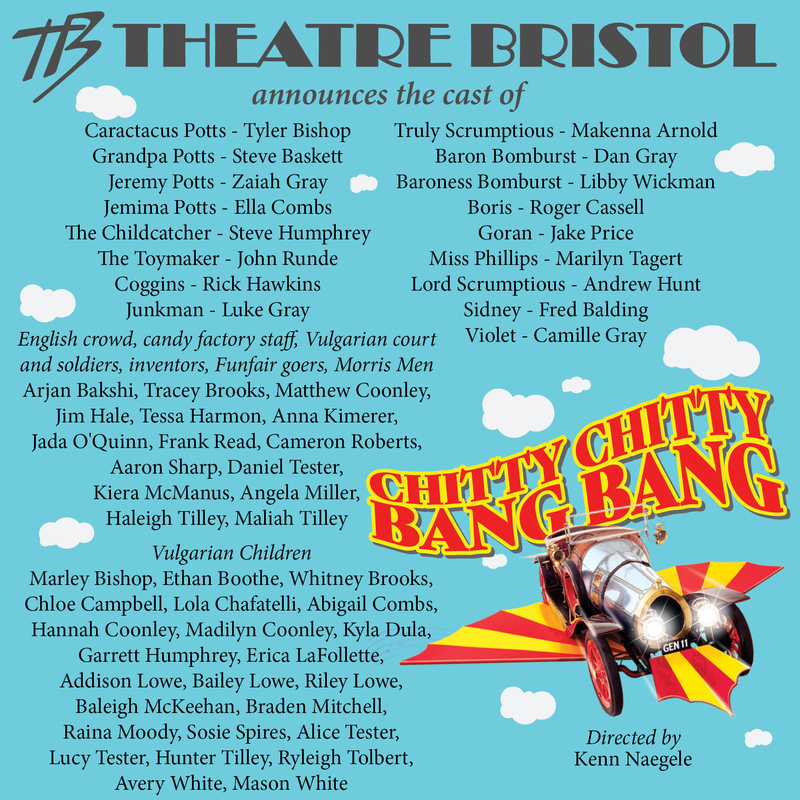 Theatre Bristol, having staged Joseph and the Amazing Technicolor Dreamcoat, The Music Man, Les Misérables, Disney’s Beauty and the Beast, and most recently ANNIE, now presents the spectacular Chitty Chitty Bang Bang at the Paramount Center for the Arts, weekends June 22 through July 1. Directed by Kenn Naegele, Chitty Chitty Bang Bang features a flying car and a cast of 56 talented performers, dogs too, from around the region. Tickets are on sale at ParamountBristol.org. “Filled with amazing stage spectacle and unforgettable songs, including the Academy Award-nominated title song, Chitty Chitty Bang Bang is a high-flying, fun-filled adventure for the entire family” (MTI Shows). Theatre Bristol is pleased to share the flying motorcar adventure this summer, the movie release’s 50th anniversary, and present a feel-good story that is ultimately about the power of family and the bonds created to overcome any obstacle. Director Kenn Naegele has performed in and directed more than 60 productions in his career in New York State and Tennessee. He most recently directed Theatre Bristol’s ANNIE at the Paramount Center for the Arts, and directed Theatre Bristol’s production of South Pacific. Music director Steve Davis is a music and voice teacher, retired church music minister, and producer. He was the director of Theatre Bristol’s musical Alexander and the Terrible, Horrible, No Good, Very Bad Day and was music director for the musical ANNIE this past fall. The Chitty Chitty Bang Bang production team also includes stage manager Nicole Intagliata, costumer Camille Gray, choreographer Khyra Lowe, scenic artist Deanna Vanders, properties mistress and vocal captain Anna Kimerer, dialect consultant Rachel Swartz, crew Steve Baskett, Ken Cornett, Delbert Hall, Cindi Brooks, Paul Pratt, David Maloney, Matthew Maloney, Albert Tester, Daniel Tester, Beverly Moody, Ava White, Marley Hillman, Devon White, Sarah Tilley, Terra White, Temmy Roberts, Tara Tolbert, Parker Dugger, and producer Samantha Gray. Inventor Caractacus Potts is played by Tyler Bishop and Truly Scrumptious is played by Makenna Arnold. Steve Baskett portrays the eccentric Grandpa Potts. Dan Gray is Baron Bomburst and Libby Wickman is Baroness Bomburst. Roger Cassell and Jake Price portray spies Boris and Goran. Potts’ children are Zaiah Gray as Jeremy and Ella Combs as Jemima. Steve Humphrey portrays the sly Childcatcher and John Runde the lovable Toymaker. Andrew Hunt is Lord Scrumptious and Marilyn Tagert is Miss Phillips. Rick Hawkins is garage owner Coggins and Luke Gray is the Junkman. Funfair tourists, Fred Balding is Sidney and Camille Gray is Violet. The Turkey Farmer is Matthew Coonley. The English crowd, candy factory staff, Vulgarian court and soldiers, inventors and Morris Men ensemble also includes James Altman, Arjan Bakshi, Tracey Brooks, Matthew Coonley, Seth Gilstrap, Jim Hale, Tessa Harmon, Anna Kimerer, Jace Lyon, Jada O’Quinn, Cameron Roberts, Aaron Sharp, Daniel Tester, Kiera McManus, Angela Miller, Colton Salyer, Haleigh Tilley, and Maliah Tilley. The Vulgarian children include Erica LaFollette as the Teamwork girl, Braden Mitchell as the Teamwork boy, Ethan Boothe as Stephen, Whitney Brooks as Greta, Kyla Dula as Susan, Garrett Humphrey as Toby, Raina Moody as Marta, along with Marley Bishop, Chloe Campbell, Lola Chafatelli, Abigail Combs, Hannah Coonley, Madilyn Coonley, Addison Lowe, Bailey Lowe, Riley Lowe, Baleigh McKeehan, Raina Moody, Sosie Spires, Alice Tester, Lucy Tester, Hunter Tilley, Ryleigh Tolbert, Avery White, and Mason White. Taffy Combs is Edison, the Potts’ dog, and a toot sweet dog along with Willow and Forest Campbell. Founded in 1965, Theatre Bristol is the oldest continuously running children’s theatre in northeast Tennessee. Its Main Stage season consists of up to six productions. Some of its performances take place in the ARTspace, a multi-purpose, black box theatre which seats up to 120, and other performances are on stage at the Paramount Center for the Arts. Theatre Bristol is volunteer run and we invite you to get involved.